Last week, the Faculty of Science recognized Biology alumna Janet McDougall at the 2016 Science Alumni Recognition Awards Reception. Janet received the Contribution to Science Award for her passion, support, and trailblazing work as a statistician, businesswoman, and pillar of her community. 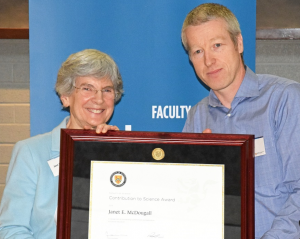 Janet E. McDougall received the Contributions to Science Award for her service and contributions to the Faculty of Science. She is renown in the world of clinical research, developing various treatments for patients in need. In 1971, McDougall earned her Bachelor of Science degree in Biology and Psychology, along with a minor in Biochemistry. McDougall is also the founder and President of McDougall Scientific Ltd., one of the country’s leading pharmaceutical contract research organization that specializes in statistics and clinical data management services. McDougall is one of the earliest supporters of the School of Pharmacy. Her involvement began with a substantial donation to the building campaign and has continued in the Donald J. and Kathleen D. McDougall Graduate Scholarship which she established to recognize outstanding graduate research and community spirit. Full award announcement can be found here. Congratulations to Janet McDougall and all of the award recipients!